A famous Bond villain observed: Once is happenstance. Twice is coincidence. Three times is enemy action. For four days straight, Sing Pao Daily, a Chinese-language newspaper in Hong Kong known for its ties to Beijing, ran on its cover page critical commentaries about Zhang Dejiang, the top Chinese official overseeing Hong Kong, and his associates. On the surface, the phenomenon defies explanation. Sing Pao’s commentaries feature inflammatory headlines and lurid graphics—on the Oct. 5 issue, for instance, the heads of Zhang and two others are positioned around a recently-used Chinese guillotine. Zhang is accused of hushing up a deadly epidemic, building a power base in Hong Kong through corruption, and violently suppressing a protest in China’s south. The attack on Zhang Dejiang by the pro-Beijing Sing Pao, analysts say, exposes the waning influence of Party leader Xi Jinping’s rival faction helmed by former Communist Party leader Jiang Zemin. The Sing Pao commentaries serve to put Zhang and the Jiang faction on notice ahead of an important Party conclave scheduled for the end of October. Between Oct. 3 to Oct. 5, Zhang Dejiang, Chinese vice chair Li Yuanchao, Chinese Liaison Office director Zhang Xiaoming (no relation to Zhang Dejiang) and his organization, Jia Qinglin the former head of a key political consultative body, and three Beijing-backed Hong Kong media had sent public condolences to the late Hong Kong tycoon Cheng Yu-tung. Cheng, a jeweler and global real estate mogul who ranks 58th on Forbes’s list of billionaires, passed away on Sept. 29. His funeral procession is due for Oct. 13. A Sing Pao commentary on Oct. 6 denounces the “representatives of Jiang Zemin” for sending their condolences to Cheng at an “ineffable” period as a way to show that they are “still around.” The commentary concludes by noting that some corrupt officials on the mainland get arrested the same day they give a speech at a meeting. Heng He, a current affairs analyst and commentator, says that while top Party leaders have strict rules about sending condolences to the deceased who make important contributions to the Party, all other condolences are considered personal. Cheng Yu-tung doesn’t fit the former category because state mouthpiece Xinhua didn’t carry any condolence messages from top officials when reporting his death. 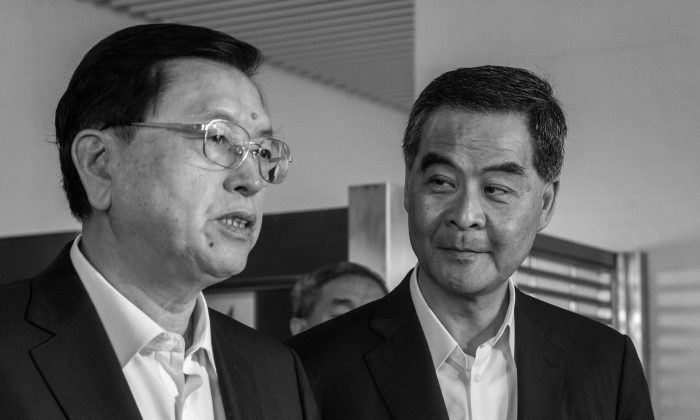 Heng thinks that Sing Pao is trying to demonstrate that they have Zhang Dejiang and the pro-Beijing Hong Kong leader Leung Chun-ying on the ropes with their barrage of commentaries. Sing Pao is “sending a message to Hong Kong politicians and leaders, and even mainland officials, to keep their distance from the Jiang faction,” Heng said. The commentaries on Zhang Dejiang are the latest in a Sing Pao Daily exposé on Leung Chun-ying, Zhang Xiaoming, Jiang Zaizhong, the chairman of two Beijing-funded Hong Kong newspapers, and an unnamed individual. Sing Pao has christened the quartet, “Hong Kong’s Gang of Four,” a nod to the ambitious political clique headed by Mao Zedong’s wife Jiang Qing during the Cultural Revolution. Many Chinese analysts note that the Sing Pao commentaries on Zhang don’t hold any new information—be it rumors or facts—about the Politburo Standing Committee member. Rather, the stinging barbs at a serving Party elite are noteworthy because they are printed in a newspaper aligned with Beijing. Sing Pao is suspected of having backing from the upper levels of the Party, particular from the camp of Chinese leader Xi Jinping. One clue is the official magazine of the anti-corruption agency citing of Sing Pao’s earlier indictment of corruption in the regime on the same day the Hong Kong newspaper published its second Zhang Dejiang piece. Wang Qishan the anti-corruption chief is a known ally of Xi. Sing Pao chairman Gu Zhuoheng, a businessman from mainland China, took over Sing Pao in 2015, and claims to have been threatened with “revenge-driven political attack” for not deferring to a “certain power,” according to South China Morning Post, a Hong Kong-based English publication. Assuming that the Sing Pao commentaries were provided by the camp of Xi Jinping, it would follow that the unnamed power harassing Gu is linked to Jiang Zemin’s faction. Sing Pao naming Jiang as Zhang Dejiang’s backer shows that Xi Jinping is “sufficiently confident” that he can “resolve the problem of Jiang Zemin, Zeng Qinghong, Zhang Dejiang, as well as former and serving members of the Politburo Standing Committee,” according to Luo Yu, a Chinese defector and son of founding revolutionary Luo Ruiqing. Xi looks likely to make his move “during the 6th Plenum,” Luo added, and not at the Chinese Communist Party’s 19th National Congress, an important political conclave where key leadership appointments are made. Over 300 top Party cadres will attend the 6th Plenum from Oct. 24 to Oct. 27. In July, Xi announced that the discipline of officials, “crucially those high-level cadres in the Central Committee, the Politburo, and the Politburo Standing Committee,” is on the agenda. Jiang has three allies on the Standing Committee—Zhang Dejiang, vice premier Zhang Gaoli (no relation to Zhang Dejiang), and propaganda and Party ideology chief Liu Yunshan. All three appear to have been served warnings through the purging of their former associates or negative publicity in official media. Xi Jinping also appears to have made inroads into Jiang himself. Earlier this year, internal disciplinary police swept dozens of government agencies in Shanghai, the long time home base of Jiang and his two sons. Zheng Enchong, a human rights lawyer whose lengthy house arrest was the result of a tussle with elements of Jiang’s “Shanghai gang,” said in March that Jiang and sons have their movements restricted, citing “extremely reliable” sources. Near Jiang’s 90th birthday in August, the police cautioned his supporters against throwing celebrations. And the fact that negative news of Jiang Zemin and his allies has found its ways onto the cover of a Hong Kong newspaper aligned with Beijing suggests that the Party elder is no longer able to fully protect his political clients. With reporting by Luo Ya.